POCSAG is a one-way pager protocol that is carried by DAPNET (Decentralized Amateur Paging Network) which was developed by German Amateurs. You can configure your Pi-Star hotspot to transmit these messages on the worldwide POCSAG frequency of 439.9875 MHz (or any other frequency you choose). See the DAPNET wiki for a basic overview of POCSAG. POCSAG is an acronym for Post Office Code Standardization Advisory Group which developed the code for the British Post Office. Your hotspot will transmit POCSAG messages on a POCSAG frequency then change back to your regular hotspot frequency. If the hotspot is busy with another mode POCSAG messages will be stored until the other mode’s hang time ends and then the stored messages will be transmitted. 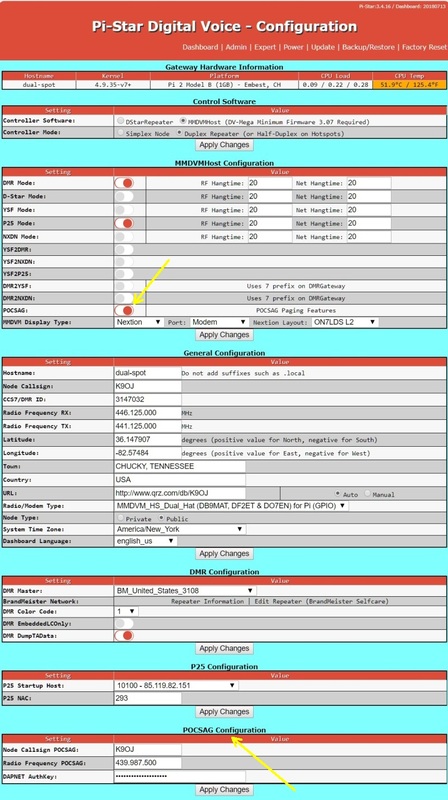 To get your hotspot ready to transmit POCSAG you start with a request for a new DAPNET Account: Open a support ticket and request a new account with RIC (pager ID) at: https://support.hampager.de/index.php The RIC code (capcode) will be your pager “address”, similar to your DMR ID. Sign in with the new DAPNET account then open another support ticket and request a new transmitter. You will receive an email with your transmitter’s node callsign (usually your call sign) and a transmitter authorization key. On main Configuration page enable POCSAG mode and click “Apply Changes”. Enable POCSAG mode in “MMDVMHost Configuration”, click “Apply Changes”, fill in the “POCSAG Configuration” section near the bottom of the page and click “Apply Changes” again. The latest POCSAG activity will show on the Pi-Star dashboard. POCSAG activity can also be seen on the “Live Logs” page. We can use the Android DAPNET app to send messages. DAPNET limits the page to 80 characters. We can send POCSAG messages by using a DMR SMS message. Send an SMS message to Private DMR Contact 262994 in this format: callsign “space” message text. You must put your DAPNET website (hampager.de) user name and password in the DAPNET API section found at Configuration/Expert/DAPNET API. Enter your TXAREA, for the USA use: us-all. Click “Apply Changes”. USER and PASS are your hampager.de login credentials (not your transmitter callsign and Authkey). TXAREA for the USA is “us-all”. To get to the SSH Access command line select Configuration/Expert/SSH Access and sign in. We can view actual POCSAG message contents in the Pi-Star log. Click on Pi-Star’s “Configuration/Expert/SSH Access”, log in, then enter “tail -f /var/log/pi-star/D*” to view all real-time POCSAG activity including message text. 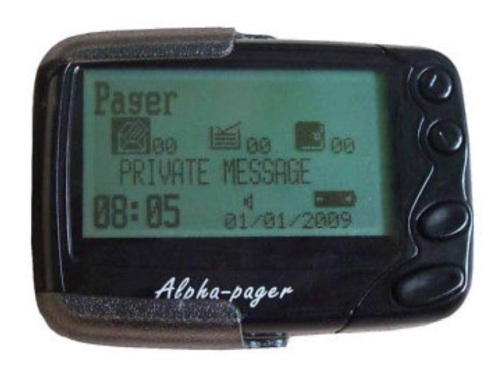 We can use a pager to receive POCSAG pages but the pager must be POCSAG capable (most are) and programmable to use 439.9875 MHz. You must also set your capcode (Channel Access Protocol code) or RIC (Receiver Identification Code) which functions as the pager ID. Pager sellers use the term “capcode” for the pager ID and may not understand the term RIC (capcode = RIC). DAPNET POCSAG messages are 1200 baud. I purchased a new Chinese GP2009N pager on ebay for $95 delivered with 3-day shipping (yes, 3-day shipping from China to the East Coast USA). It an Alphapoc 602R X4 clone. Just tell the seller, witoptech, the POCSAG frequency and your capcode (RIC) and she will pre-program it for you and all you’ll have to do is add an AAA battery and you’re good to go. The pager is hand programmable for RIC, freq and baud. I’m very happy with the pager. Here’s the GP2009N User Manual and the GP2009N Programming Software which allows you to set the frequency and up to eight RIC codes. This is the GP2009W watch version. Apollo AL-A29 – Must verify the frequency range overlaps the Ham UHF band (most don’t). 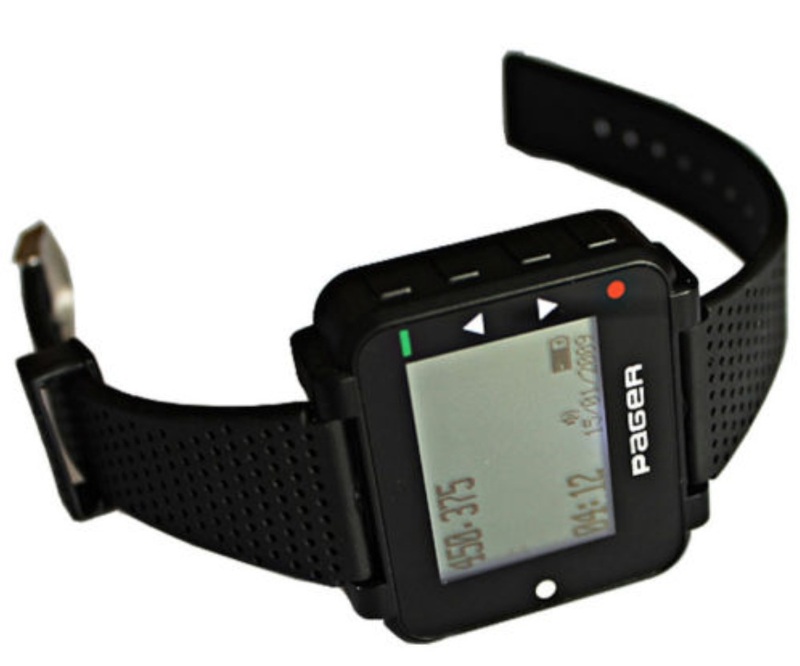 Many used commercial pagers can be used for Amateur POCSAG but be careful when purchasing. Verify it is compatible with POCSAG protocol (not just FLEX) and the frequency, Baud and capcode can be set before you spend your money. Many old pagers cannot do 449 MHz. Some allow the frequency and capcode (RIC) to be set by hand, others require a programming cable and software. Many sellers will set the frequency and capcode for you. It has been reported the Alphapoc 602, GP2009N, GP2009W and Ganray pagers use the same programming cable and software. If you have an SDR (software defined radio) you can use VB Cable (donationware) to send the SDR audio to PDW (POCSAG decoding freeware) to decode POCSAG messages. 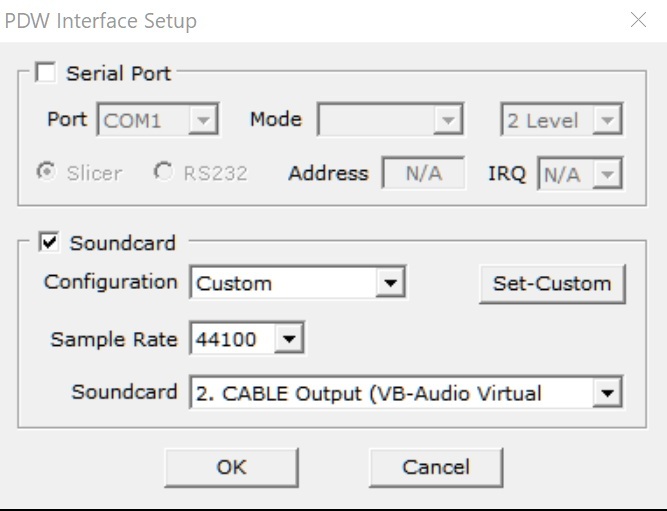 In your SDR software select VB Cable as your audio output to send the SDR audio to VB Cable. In PDW select “Interface” then “Setup” and click on “Soundcard”, Configuration: “Custom”, Sample Rate: “44100”, and Soundcard: “CABLE Output (VB-Audio Virtual)”. You normally don’t need to tweak any of the “Set-Custom” settings but adjusting them may help increase the decode percentage. 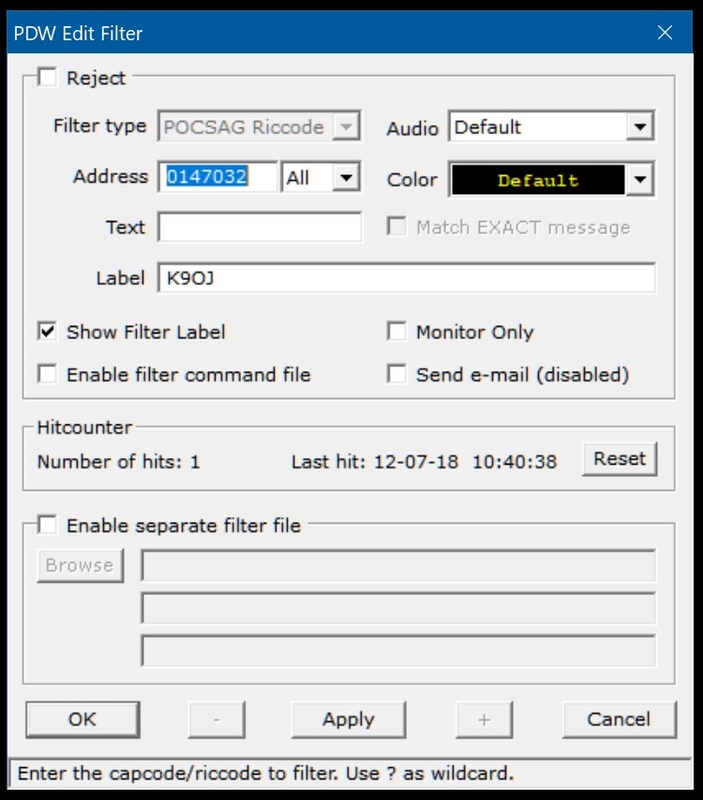 We can set a filter in PDW to do certain things when a POCSAG message comes in that matches your RIC. The message will show in the lower filter window, an alert sound will play and we can even send an email. Select Filters/Filter List/Add (Add is at the Filter window bottom left). This filter sends messages addressed to me to the lower PDW Filter Window and plays a sound to let me know I received a message. “Address” is your RIC code. Check his page for more digital mode stuff !! !